The community will host model tours of the Single Family Classics collection in Chesterfield, NJ on February 20th and 21st. 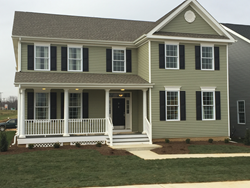 Traditions at Chesterfield will offer tours of their Shenandoah model, pictured and Alexandria model at its Model Grand Opening for Single Family Classics on February 20th and 21st. The Single Family Classics collection at Traditions at Chesterfield offers seven unique home designs with 3-4 bedrooms and 2,013-3,575 sq. ft. of living space. American Properties is inviting interested homebuyers to attend the Model Grand Opening for Single Family Classics at Traditions at Chesterfield. On February 20th and 21st from 10 a.m. to 5 p.m., the award-winning community in Burlington County will offer tours of the Alexandria and Shenandoah homes. The Alexandria and Shenandoah model homes feature four bedrooms, 2.5 baths, two-car garages and full basements. Each has open first-floor designs that offer a gourmet-inspired kitchen with a breakfast nook, spacious family room with a fireplace, formal dining room and living room. The Shenandoah also has a den for added living space. The Single Family Classics collection at Traditions at Chesterfield offers seven unique home designs with 3-4 bedrooms and 2,013-3,575 sq. ft. of living space. Each home includes upscale finishes. Optional finished basements with nine-foot ceilings and outside entrances are also available. Located in Chesterfield, NJ, voted #1 “Best Place to Live” in Burlington County by Philadelphia Magazine, Traditions at Chesterfield features neo-traditional village designs and a quaint neighborhood setting with parks, a playground, open space and future retail. Homeowners enjoy guaranteed preservation of green space within Chesterfield Township for years to come. Interested homeowners are invited to attend the event to learn more about the Single Family Classics collection at Traditions at Chesterfield. The community also offers luxury townhomes as part of its Carriage Collection. Prices for Single Family Classics begin at $399,990 and townhomes in the Carriage Collection begin at $299,990. Interested homebuyers can visit the Traditions at Chesterfield Sales Office, located at 7 Borden Lane, Chesterfield, NJ. The Sales Office is open from 10am to 5pm daily. Schedule an appointment with an on-site sales consultant by calling 609.424.0026. For more information, visit traditionsatchesterfield.com.